We spent my birthday driving from Orlando to Fort Lauderdale. Upon arriving, we quickly went to the Tiki bar where Lou had 3 awesome Margaritas and lots of appetizers. Sunrise over Fort Lauderdale beach. Most excellent singer we listened to nightly. Look how happy Lou looks. Carol caught the best fish out of all the other people on our Caribbean fishing trip. Porgy about 5 pounds. Here you see our ship the Regal Princess as seen from Princess Cayes. Lou and Carol in the Elite lounge. Carol in St. Maarten at the air strip. 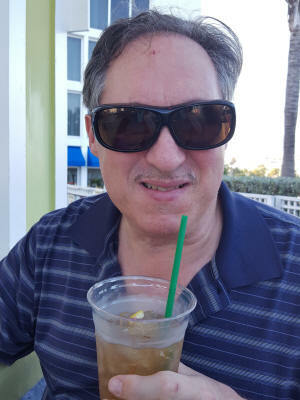 Lou enjoying the warm Caribbean sea breeze after a couple of beverages. Falmouth is the chief town and capital of the parish of Trelawny in Jamaica. It is situated on Jamaica's north coast 18 miles east of Montego Bay. It is noted for being one of the Caribbean's best-preserved Georgian towns. Founded by Thomas Reid in 1769, Falmouth flourished as a market centre and port for forty years at a time when Jamaica was the world's leading sugar producer. It was named after Falmouth, Cornwall in the United Kingdom, the birthplace of Sir William Trelawny, the Governor of Jamaica, who was instrumental in its establishment. The town was meticulously planned from the start, with wide streets in a regular grid, adequate water supply, and public buildings. It even had piped water before New York City. 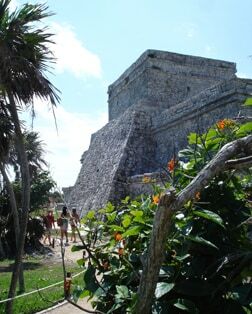 Mayan myth claims that Cozumel was home to the gods. Truly Cozumel is a place fit for the gods, with its dazzling white-sand beaches, ruined Mayan temples, exotic jungle wildlife, and crystalline waters teeming with tropical fish. Just offshore lay Palancar Reef, considered one of the most spectacular coral formations in all the Caribbean. Of course, the gods weren't the only individuals attracted to this terrestrial paradise: during its long and colorful history, Cozumel has been home to pirates, buccaneers, and freebooters, including Sir Henry Morgan and Jean Lafitte. 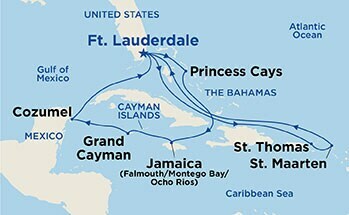 Today's traveler will discover the same ravishing beauty and relaxation that entertained gods and pirates alike. St. Maarten offers a delightful case of split personality. Legend has it that a Frenchman and a Dutchman divided ownership of the island through a walk-off: Standing back to back, the two headed in opposite directions, walking around the island until they met. Perhaps the Dutchman paused for a refreshing brew. At any rate, the French ended up claiming 21 square miles of the island to 16 square miles for the Dutch. 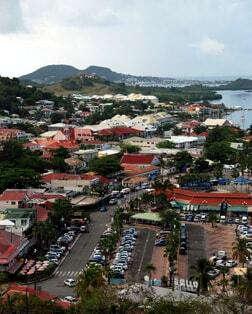 This lively tale says much about St. Maarten's easygoing ways. No formal boundary exists between the Dutch and French sides of the island; a simple welcome sign tells you when you cross from one country to the other. But the differences are as noticeable as the spelling of the island's name. The French spell it St. Martin. And it's this split personality that lends so much to the island's charms, including an international reputation for the finest cuisine in the Caribbean.